José Santino Guanco was born on May 15, 2013 in the village of La Reducción, in Tucumán province in Argentina. At seven months old, he was brought to Fundacion GAVINA by his mother. His mother was not given the a lot of information so she wasn’t aware of the treatment and rehabilitation options. 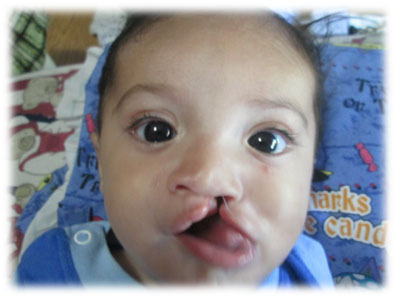 As a result, she was nervous about his complete unilateral cleft. José was underweight and had problems feeding. The team at GAVINA provided support and advice, as well as psychology sessions for José’s mom, who lacks family support. José receives audiology, dentistry, and early stimulation support. He has been gradually gaining weight and has been referred to a geneticist to investigate to investigate a possible link to a syndrome. The team will proceed with surgery once he achieves the goal weight.